Although Brandi and I will be calling Italy home within a matter of weeks, my work load with the ID Agency will remain the same as it has been since the day I started...NON-STOP. A good problem to have so I hope that doesn't sound like a complaint. Two of the accounts I'll proudly work on will be Formula DRIFT and Pirelli Tire North America. Most of everything I do for Formula DRIFT before and after the event is done behind the scenes. During the events, I'll be assisting with media relations, website/social media updates and anything else the team needs help with. The 2013 Pro Championship Season also happen to be the 10th Anniversary of the series. Many years before I had the opportunity to join their team, I was a fan. The same fan that is currently buying VIP tickets, all of the merchandise, getting autographs, taking countless amounts of photos and of course dragging their girlfriend along, used to be me. I've been a big fan of the sport, the series, the cars, the drivers and the scene since day 1. Years later, I'm blessed to travel the country visiting tracks and cities with one of the best and hardest working motorsports companies I've ever encountered. For those that've never been to a drifting event before, it's a must. I've brought friends and family (male and female) from various age groups and no matter what, they all have an amazing time. Honestly, you'd have to try really hard NOT to have a blast. 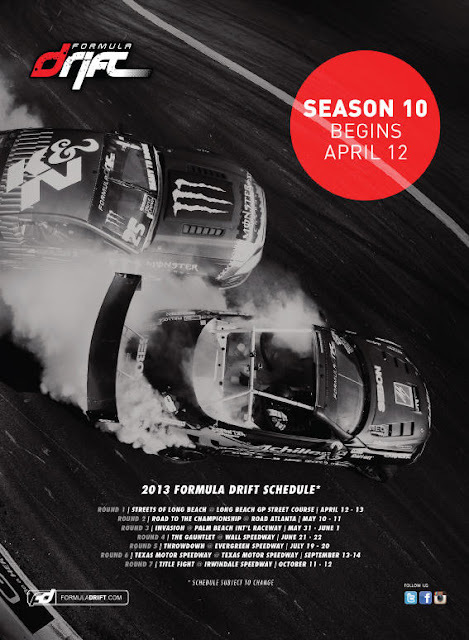 To kick off the 2013 season, Round 1: Streets of Long Beach will be happening April 12-13. CLICK HERE for more information and to purchase tickets. With Pirelli being a global company involved in so many types of motorsports, departments are broken down by the type of racing. Fortunately for me, my main focus and involvement is in Formula 1. During the course of a race weekend, I'll track and report every TV, print and/or online mention for Pirelli. Being the sole tire supplier for the series and providing different types of tires for each race, the amount of mentions is very high. Not to mention, I track each mention for the USA, Mexico and Canada. Pirelli spends millions of dollars to be involved with Formula 1 so our goal is to help show what type of ad value they're getting and how many people they're reaching with those mentions. The new tire compounds for this season were debuted earlier this week. It's a wide range of rubber compounds denoted by different color logos on the sidewall. Depending on the track layout, amount of corners and ambient conditions, two compounds are selected for each race by Pirelli. This adds to the strategy that each driver and team will prepare prior to the race. It was an action packed season last year so I'm really looking forward to this season. I'm also keeping my fingers crossed to actually attend a race this year since we'll be much closer to all of the European stops. The start of another racing season is now upon us. Ladies and gentlemen, start your engines!